Wrecked is an American 30 minute scripted adventure television series, which kicked off on June 14, 2016, on TBS and is broadcast every Tuesday at 22:00. The show is currently in its 3th season. TBS opted not to pick up Wrecked for Season 4. Wrecked officially canceled on TBS. Sign up to track down your favorite TV shows. Wrecked is a single-camera comedy. 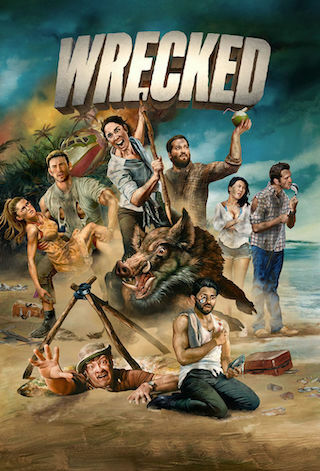 Described as Lost meets It's Always Sunny In Philadelphia, Wrecked follows a group of extremely diverse survivors of a plane crash on a remote island who must adjust to life in a dangerous new world that poses unique threats--mostly brought upon themselves. No longer plugged in, the group must navigate this new society and learn to live without the comforts of 2015 like social media, Wi-Fi, indoor plumbing, and Chipotle.